WHY SOCIAL DIALOGUE LAW NEEDS TO BE CHANGED? 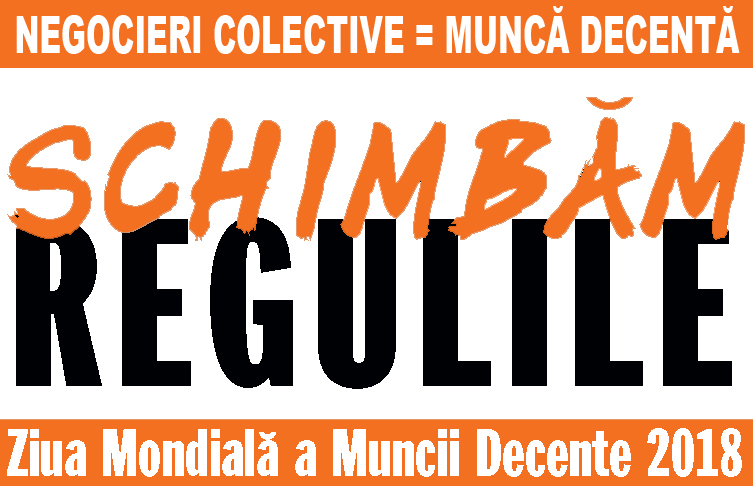 In the seven years since the adoption of Social Dialogue Law no. 62/2011 (document), as part of austerity measures, the situation of Romanian workers has deteriorated. During this period Romania had a steady growth rate above the European average, yet those who contributed most to this growth, the workers, benefited the less. More than one third of all full-time employees are on minimum wage. Lack of real negotiations pushing salary increases up has expanded the number of people paid at the minimum level (EUR 250 net) with each increase in the minimum wage. In 2011, before the adoption of Law 62/2011, about 8% of the full time employees were paid the minimum wage. Meanwhile, their number has multiplied five times. Lack of prospects for long term economic development, because there is continuous migration of the workforce, especially of qualified personnel, fuelling the braindrain (and also social dumping in Europe). In the public system, through specific legislation, salary hierarchies according to experience, level of qualification or responsibilities could still be maintained. In the economic sector, however, this can not be achieved without the instruments of collective bargaining to ensure a fair, if not proportional, increase in the other salaries as the minimum wage increases. Thus, in the economic sector, over half of the individual employment contracts are on the minimum wage or lower. At the same time, 8 out of 10 Romanians have a net basic salary of less than 2050 lei (EUR 440). Specifically, we are dealing with the levelling of wages for many employees with different qualifications and experience and holding positions with very different requirements. Naturally, this equalization produces dissatisfaction with the more skilled employees, further fueling the fluctuations of the workforce faced by businesses. The share of employees' remuneration in GDP declined significantly after 2008 and has so far remained at a much lower level than the pre-crisis period. The slight recovery in 2017, especially as a result of wage increases in the budgetary sector, does not significantly change this situation. No other Central and Eastern European country has seen such a strong downward trend in the share of employee remuneration in GDP over the last decade. This is a relevant indicator to understand to what extent employees benefit from the economic growth they directly contribute to and shows the deeply unfair distribution of the outcomes of economic growth between workers and the representatives of the capital, the shareholders. Companies keep a higher proportion of revenue, as profits, to the detriment of wages, and it is necessary to renew collective bargaining to achieve fairer wages. There are also other indicators that show the deterioration of the situation of Romanian workers: the level of in-work poverty is highest in Romania, as one fifth of Romanians having a job are at risk of poverty, double the European average, social inequalities are also very high while the rate of profitability per worked hour has increased. Romania ratified Convention no. 87 of the International Labor Organization on freedom of association and protection of the right to organize, as well as Convention no. 98 on the right to organize and to negotiate collectively. Also, the Convention on the Representation of Workers (No 135) and the Collective Bargaining Convention (No 154). 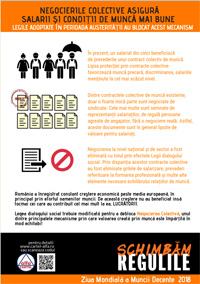 According to the Romanian Constitution, they have priority in their application to domestic law. In the 2011, 2012, 2015 and April 2018 Memoranda of Technical Comments, the International Labor Office provides assistance and expertise to modify legislation in line with the Conventions and Recommendations of the International Labor Organization. Social Dialogue Law limits the excercise of the right of association as a trade union can only be set up by at least 15 employees, who must work with the same employer. Given that Romania's economy relies predominantly on small and medium-sized enterprises - 92.5% of the Romanian active enterprises have less than 15 employees – for about a quarter of the employees the law prohibits the exercise of the fundamental right of association guaranteed by the Romanian Constitution and the international treaties and conventions ratified. Moreover, since only employees with employment contracts have the right to be trade union members, the law prohibits this right to other categories of workers, such as the day-labourers (working in 14 sectors of activity), the self-employed or those employed in new types of work relationships in the digital economy. There are about 1,5 million independent workers, and almost half are out of the social security system, being the least protected social category and most at risk of poverty. Thus, the provisions of Law 62/2011 prevent a large number of workers from setting up or joining a trade union in order to promote their collective rights. Changing the provisions of the law in order to allow the founding of a trade union by 15 founding members, working in one or more undertakings in the same sector. Including a provision so that the right to form and/or join a trade union is recognized for all categories of workers, not just to those who are employed under an employment contract. 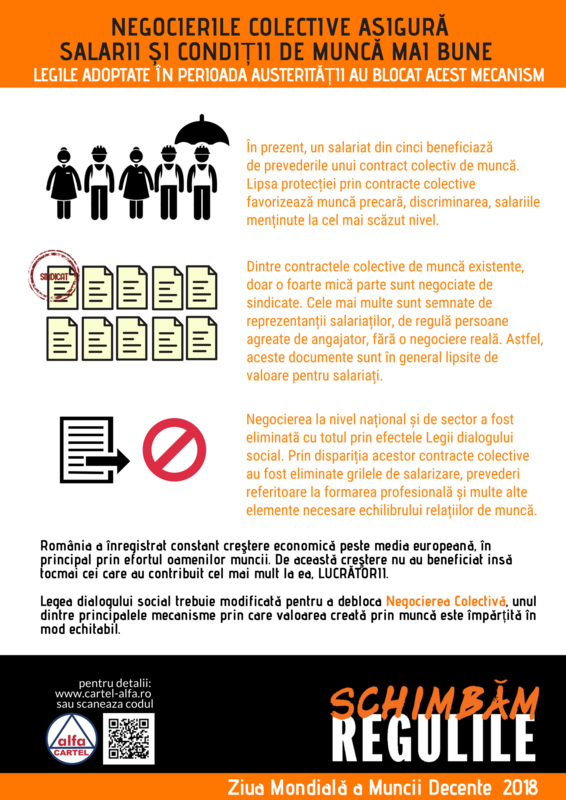 Legea interzice încheierea contractului colectiv de muncă la nivel național. Ultimul contract naţional a fost eliminat abuziv în 2011 prin voinţa guvernului, fără a prelua însă în legislaţia naţională prevederile sale, rezultatul unui îndelungat proces de dialog social bipartit a partenerilor naţionali. Astfel, dintr-un condei s-au pierdut grilele diferenţiate de salarizare care stabileau niveluri mai ridicate ale salariului minim pentru niveluri mai ridicate de calificare, obligativitatea formării profesionale, obligativitatea angajatorilor de a stabili normele de muncă în acord cu sindicatul ş.a.. The law prohibits the conclusion of a collective labor agreement at national level. The last national collective labour agreement was abolished in 2011 by the will of the government, without however taking over into the national legislation its provisions, the result of a lengthy process of bipartite social dialogue of the national partners. Thus, the differentiated salary scales which set higher levels of minimum wage for higher levels of qualification, compulsory vocational training, employers' obligation to establish the workloads in agreement with the trade union, and so on, were suddenly lost. In order to have a collective agreement at sector level, the trade union organizations participating at the negotiating table must represent at least 50 per cent of the employees in the whole sector. At the same time, employers' organizations participating in the negotiation must have 50% +1 of the employees in the entire sector. Thus, the conditions imposed by the law for the conclusion of collective agreements at sector/branch level are exaggerated and unrealistic. Practically, at this level, collective labour agreements have completely disappeared from both the private and public sectors, the number shrinking sharply from 47 agreements concluded between 2005 and 2010 (an annual average of 8 agreements) at 0 (zero) between 2011 and 2018. Changing the conditions for the conclusion of collective agreements at sector level so as to reflect the real situation and which can be achieved in practice. Applying erga omens to the collective labour agreement if trade unions and employers' federations are representative. In order to negotiate the collective labour agreement at the company level, and, if an agreement is not reached, to be able to trigger the labour conflict, a trade union must have as members over 50% +1 of the employees in the company (including part-time or fixed-time workers). The threshold is difficult to achieve, and a small number is enough to withdraw (at direct or indirect pressure) to prevent the union from achieving the threashold or to lose it. In addition, Law 62/2011 limits the possibility of action of the unrepresentative trade union: it can only negotiate the collective agreement if it is affiliated to a representative federation in the sector of activity, but in that case, employees’ representatives also take part in the negotiations. If, however, no agreement is reached with the employer, the union has no right to trigger the labour conflict (strike), thus being denied the main instrument for promoting the collective interests of its members. 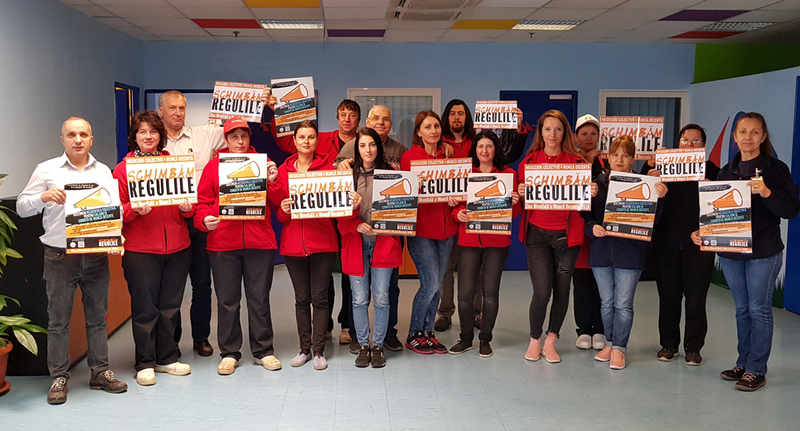 Instead, even if the trade union disagrees, the collective agreement can be registered anyway, with the signature of the employees' representatives. Thus, the law favors employees’ representatives against trade unions. In the absence of a clear and validated procedure for their election - unlike trade unions who have to take a difficult route to obtain legal personality – employees' representatives are often close to management and sign collective labour agreements without a real negotiation. What is worrying is that these agreements generally take over provisions from the law or provide hypothetical rights (for example, with phases like: "Employees can benefit from ..." and not including the conditions under which the alleged benefit is materialized). 9 out of 10 collective labour agreements concluded in recent years in the economic sector have been signed by employees' representatives, lacking substance in terms of benefits for workers. Instead, their main function is to ensure the so-called social peace for the employer, to make it look good in front of business partners or investors and to prevent real bargaining with employees. Changing the provisions of the law so that the employees’ representatives be able to negoctiate a collective agreement only in units where there are no unions. Reduce the threshold for unit-level representativeness to 35%, as recommended by the International Labour Organization. In the context of the World Day for Decent Work, the NTUC Cartel ALFA is lauching the campaign "Change the rules" which aims to increase the awareness of the working conditions in Romania and to support the initiative to change the social dialogue law, as drafted by the Coalition for Decent Work, with the support of the trade union confederations, with the aim of removing the obstacles blocking collective bargaining in Romania. WORKERS HAVE THE RIGHT TO A DECENT LIFE FROM WORK! 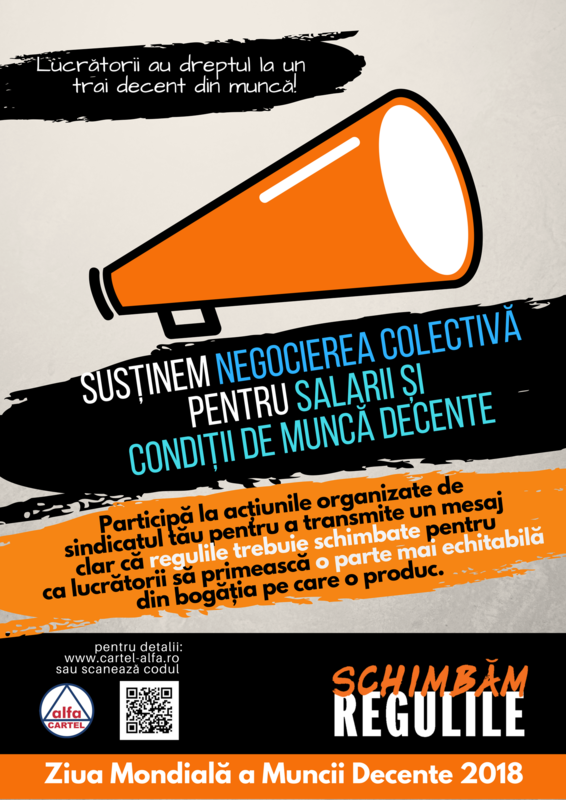 We call on decision-makers to tell them that the rules need to be changed so that workers' fundamental rights are respected, a necessary and minimal condition for decent work to become a reality for Romanians working in their own country.